Realtors are “people persons”. A big part of our job is meeting new clients. Without them we couldn’t possibly survive in such a competitive industry and being able to develop a good rapport quickly is essential if we are to be successful. For some of us this is easy to do because it is part of our natural personality. For others developing a business relationship quickly is challenging and requires a conscious effort. We all know how important first impressions are, especially when we are trying to cultivate more business for ourselves. It’s important that we are able to gain the confidence of a new client from the very beginning. If we are perceived in the wrong way it’s a sure bet that we will not be the agent that they choose to represent them. Appearing nervous or unsure of ourselves is one way to tell our prospective client that we are not the right agent for them, even if we are able to convince them with our words. Proper eye contact is the secret to appearing confidant and capable. If we fail to make eye contact, than we may appear shy or unsure of ourselves. We could also give the impression that we are disinterested in what the other person is saying or at the very least we are thinking about other things that we deem more important. If we maintain eye contact for too long a period of time it may seem as if we are trying to “stare down” our client. We may give the impression that we are overly aggressive or “pushy”. Neither of these two scenarios is likely to result in a successful first meeting. The real secret to using eye contact properly is to look the other person directly in the eyes in the beginning but only long enough to notice the color of their eyes! As soon as you think “green” than it’s the right time to avert your gaze. For whatever reason, this is the period of time that will show you are friendly and engaging but not over domineering. As small a gesture as this may seem it will help to set the proper mood for what is to come next. Now that you know how to use proper eye contact during your greeting of a new client or associate you might be wondering what to do during longer and more involved conversations. There is something that is known as the “triangle trick”. It can be uncomfortable for both parties involved if one is constantly staring into the other’s eyes when they are talking. This simple trick will allow you to appear interested no matter how long the conversation may last, even if you are bored to tears! Imagine a triangle that encompasses the other person’s entire face. The apex could be at the eyes and the bottom of the triangle could be at the mouth. 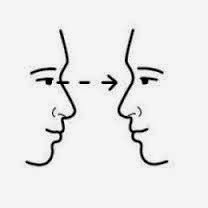 All you need to do when the other person is speaking is to move your eyes from one point of the triangle to another every five to ten seconds. This will avoid the uncomfortable feeling of constantly staring into someone else’s eyes while still giving the impression that you are paying attention to what they are saying. If you try this you will see that it actually works! It may seem a bit awkward at first but with just a little practice everyone you meet will be left with the impression that you are confidant, engaging, warm and attentive. And after all, isn’t that the reason that you would choose someone to represent you in an important business matter?